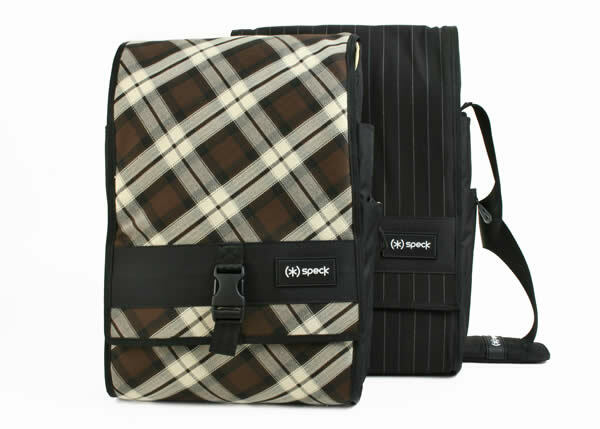 For my trip to Toronto last month, I chose to travel with the PortPack Shoulder Bag from Speck. Designed to fit laptops with screen sizes of up to 15-inches, the PortPack is designed to be compact and lightweight. The slim design is ideal for taking your laptop and a few extras with you and it’s packed with some neat features that help you keep everything organised and accessible. Speck has continued their tradition of combining form together with function with a stylish and smart looking bag range consisting of two colour schemes. You can get the PortPack in Coffeehouse Brown finished with a cream interior or Black Pinstripe design complemented by a baby blue interior. 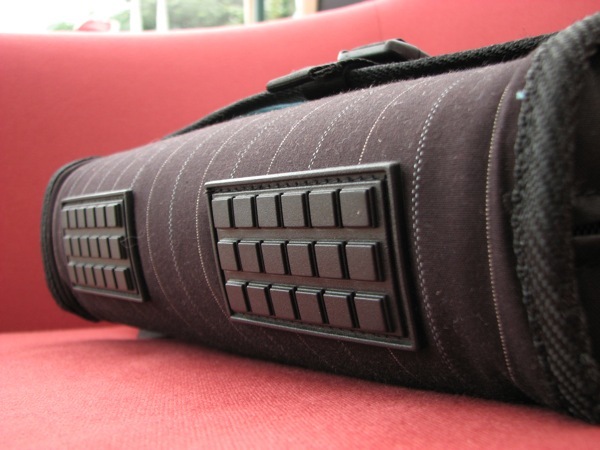 The PortPack flap opens up by releasing the buckle and then pulling it away from the Velcro. 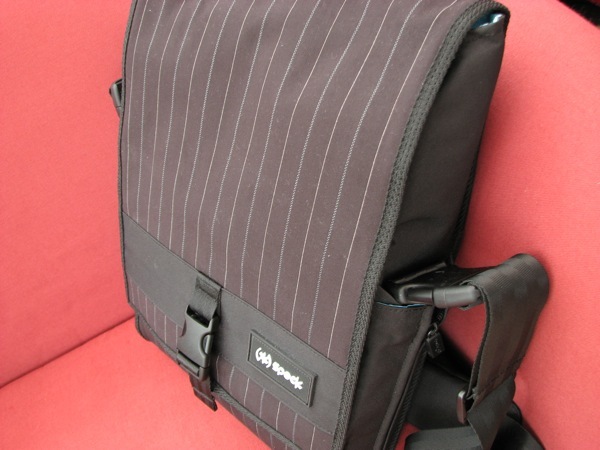 Inside, you’ll find a front zipper pocket – large enough to fit slim items such as CDs and flash drives. Inside this zipper pocket, there is also a cord that you can use to attach your keys to. 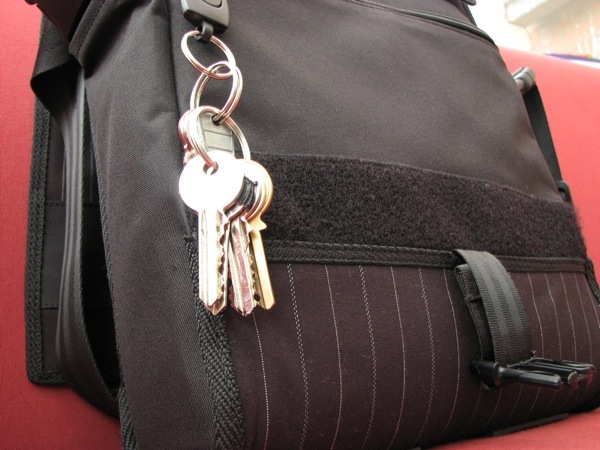 The cord is long enough that you shouldn’t need to remove your keys for opening doors whilst you’re carrying the bag. Not long enough? No problem, just push the release button and it frees your keys from the cord. There’s a couple of pockets that you can use to store your phone or media player. One side includes a mesh lining on the front pocket for storing your headphones as well as a hole for the headphone jack to feed through to the inside of the pocket. Providing you have headphones long enough, this will allow you to keep your media player in the pocket whilst listening to your tunes. On the opposite side, a standard pocket is included for storing a secondary device such as a phone. 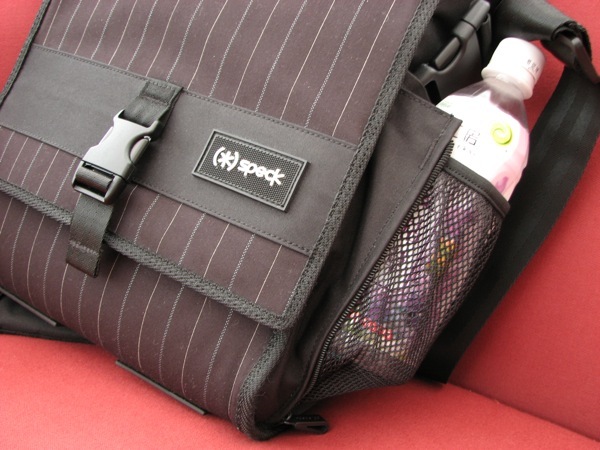 On the side of the PortPack, a very useful design feature provides you with storage for water bottles. I found this to be invaluable as I hate having to carry around unfinished water bottles in my hand but don’t want to put it inside my bag for lack of room, inconvenience or fear that it may end up spilling/leaking. The bottle holder remains hidden when not in use thanks to the zipper. Unzipped, the flexible mesh lining that comes out allows you to store not just those small thin water bottles, but can easily accommodate fat chunky ones. Around the back, there’s a deep storage pocket, ideal for carrying documents or a newspaper. Just above that is zipper that looks like it might either provide access to inside the bag or another pocket. To my surprise when I opened it, a carry handle pops out. I’m not entirely convinced that this is a clever idea as I’m leaning towards the opinion that this was designed to make the bag look a bit neater. Inside the PortPack, you’ll find two compartments – one for your laptop which is finished with a micro-fleece padded material and a quilted nylon finish for the second compartment. A pencil-case sized zipper pocket can also be found in this part of the PortPack. Your laptop is secured with a Velcro strap for added stability. Along the bottom, there’s a couple of feet that help the bag lean on slippery floors. There’s nothing more annoying than a bag that just won’t lean against a counter or wall. Speck has poured some good design ideas into the PortPack. 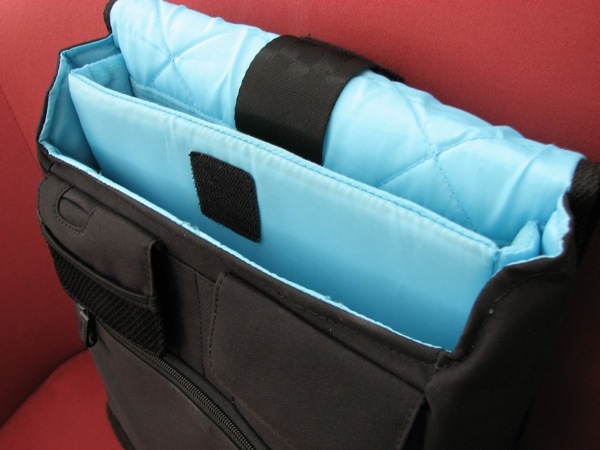 The compact design fits comfortably around the shoulder and can also easily slip underneath an aeroplane seat. My favourite part of the PortPack has got to be the bottle holder! It’s not great for taking lots with you, but that’s not why you’ll buy the PortPack. It’s the smart design and clever use of the room that is available in the slim design that make this an excellent product. You mentioned that this bag fits underneath the seat of an aeroplane. Is that in coach class or what? Does it leave any room for your legs and feet to stretch? Speck seem to be on a roll these days – great products and great review. @Freeman: Can’t honestly say I’ve ever been able to afford a ‘premium’ seat. The PortPack fits nicely underneath an economy seat on American Airlines and American Eagle. Room-wise, it leaves you with enough room to fit your seat either side of the bag.